It is back to school time for local colleges and David & Margaret is grateful to be included in their programs for new and returning students. Over the past week several colleges have asked their students to engage in the community and to experience the power of volunteering. Pomona College’s Outdoor Education Center had a training for Outdoor Leaders and they invited David & Margaret to come and provide an overview of the programs we offer. Julie Griffith, PR Coordinator for David & Margaret was able to share with the student leaders about foster care and some of the many challenges and trauma youth in foster care face. It was an opportunity for the students to not only learn about foster care, but for them to think about what life is like for youth in foster care. The student leaders participated in a service project that required them to put themselves in the shoes of the foster youth and figure out for themselves what they would need as they started their adult lives without any family support. (example: cleaning supplies for foster youth moving into their first apartment). And the end of the exercise they had assembled over 40 backpacks full of supplies for youth aging out of foster care. Claremont Graduate University, another of the Claremont Colleges, also invited David & Margaret to participate in their new student orientation. 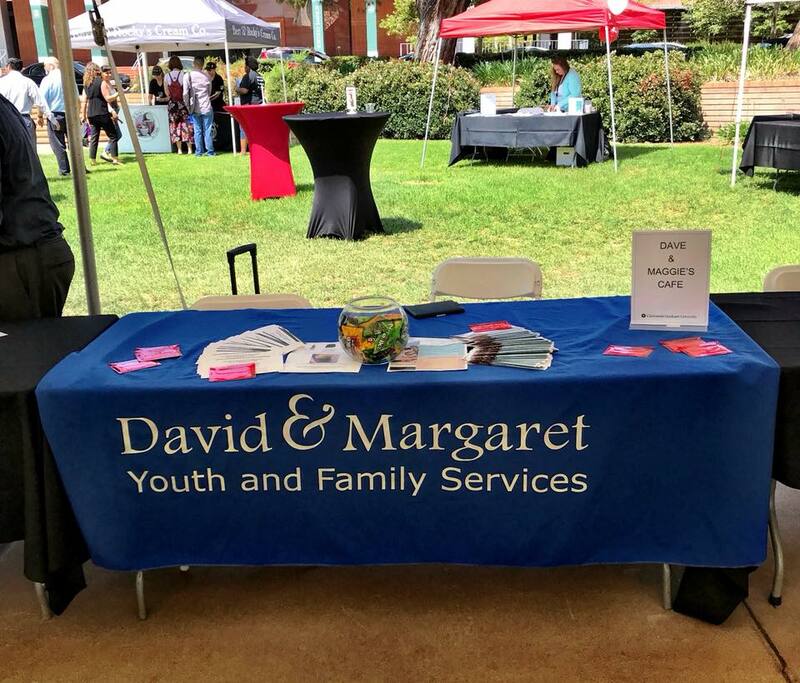 With over 300 new students attending it was an opportunity to share about the many programs at David & Margaret. At the orientations D&M featured one of the social enterprises run by David & Margaret - Dave & Maggie’s Cafè. The Cafe offers youth aging out of foster care paid culinary internships while providing the community with a great place for a coffee or quick lunch. Dave & Maggie’s Cafè always offers 10% off to college students with a valid ID and we hope to see students from all the Claremont Colleges, The University of LA Verne and all the local colleges soon!